Now we say we have two ears and one mouth. Listen more than talk. By asking good questions we can learn about our customer, their problems and how to solve them. When we listen actively the customer feels respected and will open up to our queries. You have had the experience where in conversation you can’t get a complete thought out because of being interrupted. Borden and Busse make the point that your interrupting your customer just serves to irritate them. Resist the impulse to immediately respond with “a brilliant, immediately crushing retort.” The goal is to get the order. Using strategy and tact is the better way to get your customer “-a touchy, emotional, somewhat vain human being-“ to award you the order. Rather than interrupting the customer when they are speaking note your question and ask it at an appropriate time. By asking open-ended questions focused on the customer and their wants or needs the great salesperson finds out how to close the sale. Borden and Busse present this principle more like and attorney preparing for trial than a great sales person looking to form or maintain a long-term, mutually beneficial relationship. Nevertheless their premise of finding out all you can about the customer and their problem before making a presentation is valid today. During the course of a sales cycle, great salespeople have several conversations with decision makers and their team. At each stage of the sales cycle it is important to confirm previous conversations. This shows the customer you have an understanding of their problem and confirms your solution is the desired one. The best salespeople do this by again asking questions. The authors suggest confirming your customer’s answer to each of your questions as you move along. Great salespeople do this with tact as the conversation develops. Confirmation is particularly important when dealing with an objection. By restating the objection and getting confirmation from the customer you are better prepared to overcome it. Think about the last several sales calls you made. Did you apply these five principles? If you are a seasoned sales professional, do you have similar principles which have made you successful? If you are new to sales, check with your mentor about the principles he or she believes in. 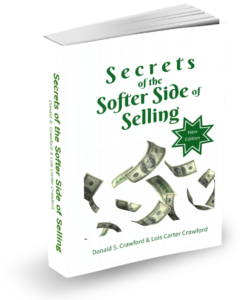 To learn more sales secrets see Chapter Six, Characteristics of Successful Salespeople, in Secrets of the Softer Side of Selling. For even more sales help, join our FREE Sales Club! “See” you next week.